We generally sow wheat the season after potatoes or peas have been in the field. This is because the level of nutrients left behind after these crops promotes a good crop of wheat. We currently grow three varieties Consort, Viscount and Riband depending on the soil type in the field and the time of year that the field is sown. All our wheat is sold for distilling or animal feed for use in Scotland. 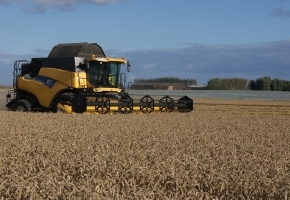 Like our Spring Barley, we are audited by Scottish Quality Cereals to ensure that we maintain a high standards of crop husbandry and storage with regards our crop of wheat.